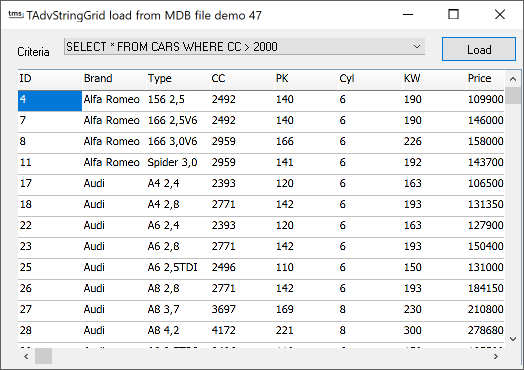 2 New methods enable loading of Access tables in the grid : LoadFromMDBSQL and LoadFromMDBTable. Both methods use ADO. Note that this imposes no requirements at all for grids that do not use this feature on the availability of ADO on the target machine. This method loads the selcted table from the MDB file into TAdvStringGrid. From there, it can be printed, exported to HTML, CSV etc ..